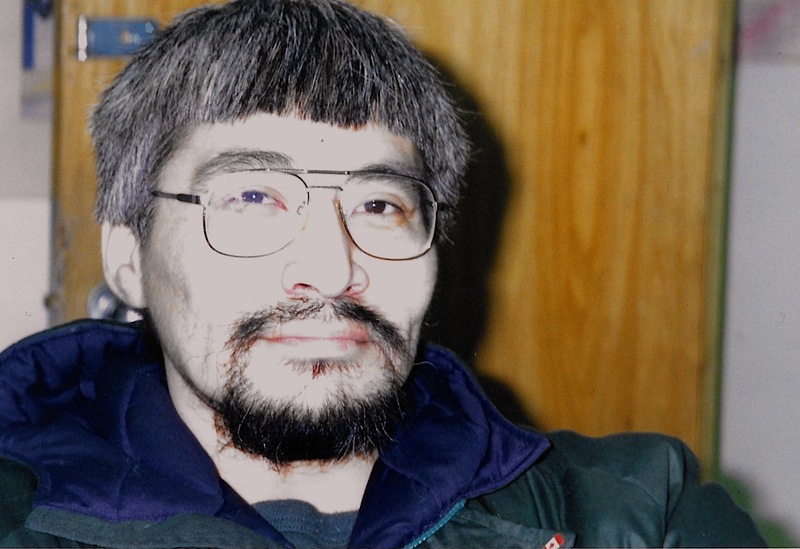 In May 1996 I was once more in Salluit, a community on Nunavik’s Hudson Strait, this time working with Inuit broadcasters at the Taqramiut Nipingat Inc. network. This radio and television network brings news to Inuit in Nunavik, in Inuktitut, and I was helping them develop a series of television specials to celebrate their 20th anniversary. By this time of the year, the days were getting warmer as the sun shone from early in the morning until late at night. Even on cloudy days, the sun sent out swaths of sunlight that lit up the mountains at the far side of the fiord facing the community. Children screamed happily as they slid down the slippery hills around Salluit and there was a soft milling sound in the background as snowmobiles headed off on the land. Each breath was full of that heady springtime combination of exhaust and melting snow. I told him I have no idea, but this question made me laugh. Koperqualuk was always surprising me. He was the secretary at TNI, but we discussed the story lines and planned interviews together for TNI and for reports I was also working on for CBC radio at the same time. He became much more than an interpreter when we talked to people together: Koperqualuk was able to translate simultaneously for me, but at the same time he was also planning the next question that I should ask before I could even think about it. 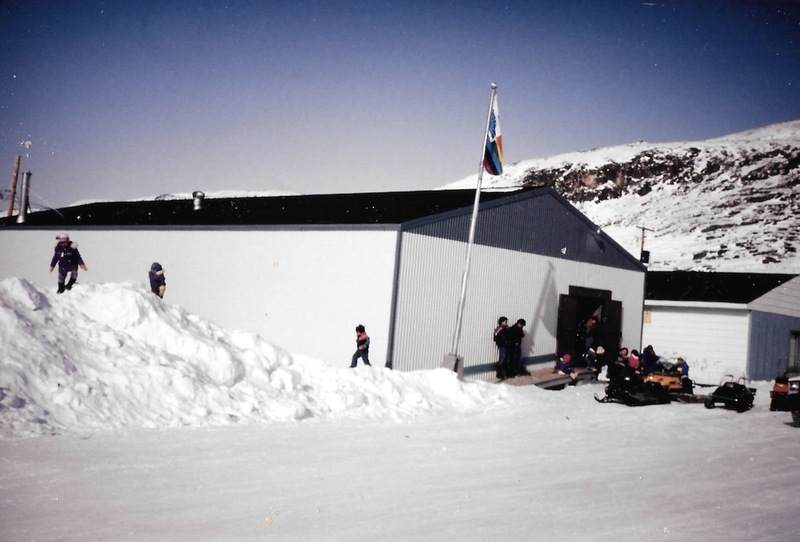 The small TNI studio was almost entirely run by Inuit — the only other non-Inuk around maintained the equipment. Daily radio broadcasts and weekly television programs were all prepared by Inuit: there were no non-Inuit here behind the scenes thinking they make things work. One of the employees never showed up the whole time I was there, but Koperqualuk and the other employees looked down on him. Koperqualuk arrived at the office every morning at 8:30 a.m., and often stayed until late in the evening, to finish an important document or plan for the next day. Elder broadcaster, the late Elashuk Pauyungie, then 55, was in charge of radio programming, and she took her work seriously, too. I learned that Pauyungie, who spoke only Inuktitut, had lived in an igloo until she was 17. She never went to school. When she was young, communication was limited to letters between camps, often delivered by dog-team. The community of Salluit didn’t exist. And, when I’m there, Salluit was on the brink of more big changes. The giant nickel mining company Falconbridge Ltd. was starting to build the Raglan nickel mine, located not far from the community. People in Salluit were hoping for jobs at the mine: With unemployment officially at 30 per cent, any new job possibilities were welcome. Down at the former restaurant, a group of students had started a two-year professional cooking course. When I visit, two of them were cutting up onions and potatoes for a salad, while another mashed eggs for sandwich filling. Another added whipped cream to a pie for dessert. As part of this course, the class had also been learning about making balanced meal menus and reading recipes. When participants mastered all aspects of cooking, they hoped jobs would be waiting for them at Raglan mine site. The Quebec government gave Falconbridge the go-ahead to develop the Raglan nickel mine site in May 1995. Only a year later, serious construction work was beginning at Raglan, and jobs for qualified Inuit employees had already opened up. 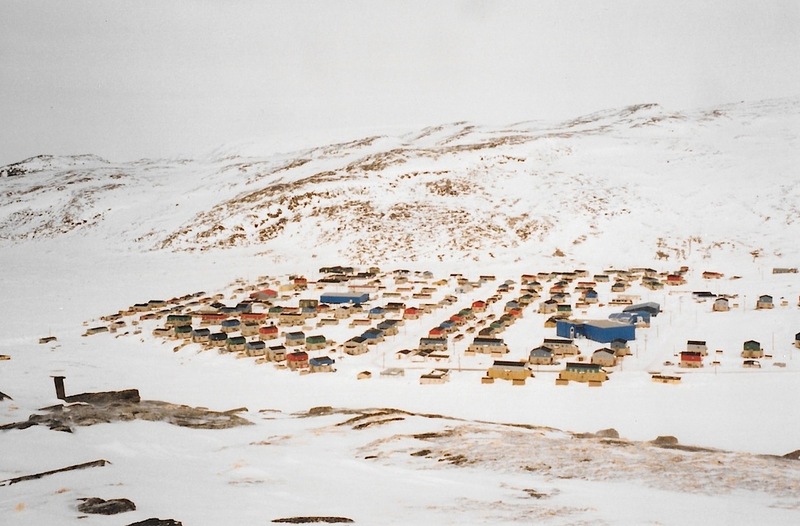 Salluit and Kangiqsujuaq, the other community near the mine site, were also looking to link up with southern-based companies to make money. About $75 million in compensation (and that turned out to be a low estimate) was already guaranteed over 20 years as part of the Raglan Agreement that Inuit signed with Falconbridge in 1995 — money that could be used by the communities to invest in joint ventures. But critics said this economic progress would come with a cost, environmental and social. Contaminants and pollutants might be stirred up by the mine’s construction as well as by the production and transport of nickel. And nearby Deception Bay, a favourite hunting spot, where huge tankers would someday fetch nickel concentrate and deliver fuel, could be at risk from spills, airborne particles and run-off from the nickel extraction process that can produce substances like arsenic, chromium, cobalt and lead. Wildlife that provide country foods to Inuit in the region could also be affected by these contaminants. Concern for the fragile environment around a future provincial park not far from the mine was also surfacing. The park would surround a huge naturally-formed crater called Pingualuit. Formed by the explosive impact of a meteorite 1.4 million years ago, this crater lake’s water is exceptionally pure, so clear and soft that researchers used it to study the atmospheric fall-out of trace elements. Of course, the official word was then always that everyone supported the Raglan mine, but I didn’t have to look very hard to find dissenters. Putulik M. Okituk had nothing to fear from being outspoken. Twenty years earlier he had fallen off the top of the large gas reservoirs in Salluit while sniffing gas. He broke his back and had been in a wheelchair ever since. That fall changed his life, he told me. In 1996, Okituk spent his time reading, listening to radio, playing crossword puzzles and thinking. When I went over to his house, we chatted over tea. On this visit to Salluit, I learned that since I last saw him, Okituk had become also a municipal councillor. He was upset that more local people didn’t show up here at a meeting held in early 1995 to discuss the project with representatives of Falconbridge. Okituk said those who did were handicapped by their poor grasp of English. “The people who could understand the proceedings were not fluent enough to voice their concerns or to oppose the meagre offerings put before them,” he said. I also went with Koperqualuk to visit Jimmy Kakayuk, one of Salluit’s elders, to talk to him about the mine development. Kakayuk said he wasn’t impressed by a $350 cheque he had received as part of the compensation money from the Raglan Agreement. To Kakayuk, the cheque seemed a bit like a pay-off. “What did I do to deserve this?” asked Kakayuk, a hunter and carver who not is used to getting something for doing nothing. Despite promises of money and proper environmental management, in 1996, there was huge uncertainty over just what changes the communities would face during the estimated 20-year lifespan of the mine — which is still in operating in 2015. In 1996 people said they are also worried about environmental damage and how this would be monitored. 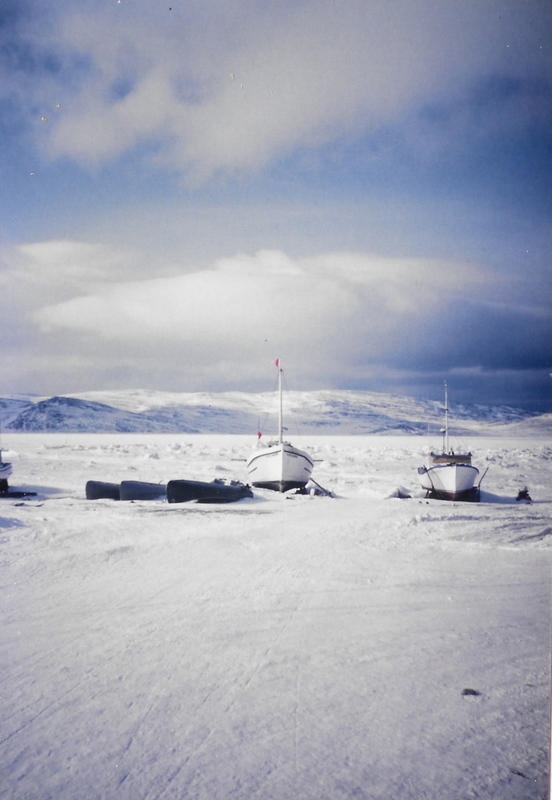 “The only time Inuit go out extensively on the land is in winter and we’re in snowmobiles. What covers debris and garbage better than snow?” a critic of the mine said. One afternoon I went out snowmobiling with L., a broadcaster at TNI. We headed out from Salluit down the bay. On both sides we were flanked by cliffs. Everything was white. She dodged giant hummocks of ice. Finally, we stopped by an open spot of water where locals came to harvest mussels. L. smoked a cigarette, while I looked around. It was May 4, and I was standing in an icy landscape, while I knew that in the South the first spring flowers were already in bloom. On the way back, we decided to head up one of the steep hills around Salluit. On top, the wind was blowing so hard it almost knocked us over, but you could see for kilometres, right over to Hudson Strait. The community spread out below us. In the 1960s, only a few dwellings hugged the shoreline of the bay. In 1996, new houses entirely filled the space between this hill and the next. A suburb had even sprung up since my last visit, a cluster of houses about 15 minutes from the centre of town, on the way up to the airport. We raced down the hill back into town. While we were out on the land, I felt free: the streets of the community seemed to clash with the ice and snow we just navigated through. I relished being in Salluit. I went to the Anglican church on Sunday, where I was invited home by fellow worshippers for Arctic char. I shopped at the co-op store and ran into people I knew. I went visiting at night. I spent my evenings drinking tea and eating pilot biscuits. I visited with Elisapie Isaac, then a high school student and young broadcaster at TNI, who later would become a singer known throughout the North, in Quebec, and beyond. When I leave Salluit, I was brought to the airport by Salluit resident Bill Smith. He always wore a tasseled crocheted hat, a nassak, with the word “Salluit” woven in the design. As he dropped me off at the airport terminal, I suddenly remembered this hat from that first trip I took to Puvirnituq in 1991, but five years later, I, like everyone else that day, five years earlier, knew who the man wearing this hat is. This time he also knew me. Like an iceberg continues April 29.